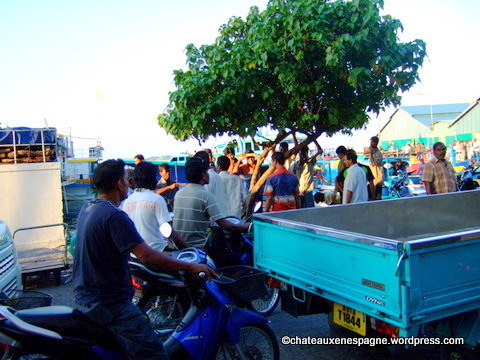 Tourists come through Male each year in their thousands. 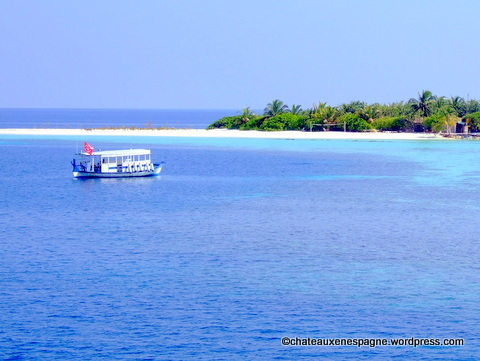 They arrive by plane, and from the airport island, boats take them to their resort hotels on the coral atolls. 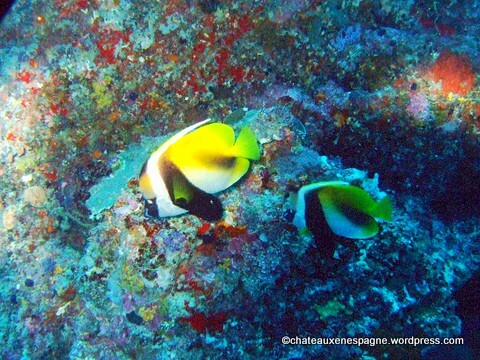 They snorkel in the shimmering blue water of the Indian Ocean, admiring shoals of multi-coloured fish. They have paradise weddings, and stroll barefoot on coral sand by the waterline. The warm sea ripples gently over their toes, scribbling the sand with refracted sunlight. They sit for a week or two on sun-loungers, looking at the white beaches, the palm trees, the turquoise sea and sky that merge into one another. Then they go away again by plane. 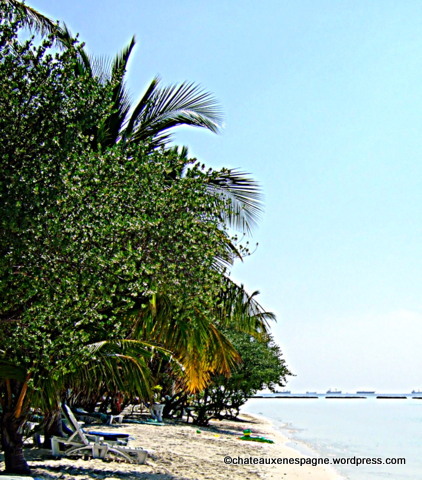 Male, the Maldives capital, sits across the water from the airport, on its own atoll. Here, Miah, Uddin and Zaman sit around too, but they are not tourists. They are migrant workers from Bangladesh, here to send money home. 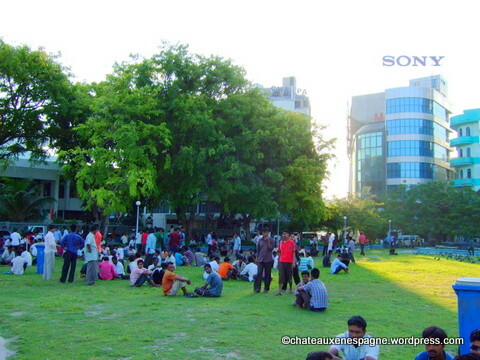 They sit with around a hundred other men, on the grass under the mimosa trees, in front of the police station. Normally it is hot and sunny, but today, in late October, the rain is sheeting down, sticking their shirts to their skins. The blue and red painted fishing boats have come in, and are landing grouper and yellow-fin tuna on the quayside. The catch is taken across the main road, to the fish market, and a crowd gathers as the fish are thrown on the bloody, salty tiled floor inside and sorted by size. But there is no work for the three Bangladeshis there. ‘Well, nowhere to sleep! Another week of this, we’re going to starve’ says Miah, shivering. ‘If only we can get a hotel job. Get a bunk room, uniform, meals.’ Miah is from an apartment block near the railway in Malibagh Bazar, Dhaka. He finished high school, and travelled to Male hoping to get a white collar job, work his way up to be a supermarket manager or something, but it hasn’t worked out. He has a perpetual frown, as if squinting into the sun, even when it isn’t sunny. Zaman is the oldest of the three, stocky with a broad rounded face. His skin is the colour of a strong cup of tea, and he has a heavy, placid expression. ‘My brother went to Abu Dhabi,’ said Zaman. ‘Working in the oilfields. He sends home three thousand takas every month.’ Zaman’s other three brothers work in the huge ship-breaking yard near Chittagong, where the hulks of old supertankers are moored off Faujdharat beach, to be stripped down by a swarm of workers, and darken the sand, and the Bay of Bengal, with rusty oil and toxic sludge. The three brothers, their wives and children, and his widowed mother all live in a simple concrete house amongst the mangroves. Uddin says nothing. He has only recently arrived from the north of Bangladesh, and doesn’t know his way around. He has attached himself to the other two, hoping that if they find something, he will get a share. He passes himself off as twenty, but he is small and slight and he doesn’t even look fifteen years old. ‘I worked in a hotel once,’ says Miah. ‘It was only a cleaning job, all I could get. For anything else you need two years’ experience. Even for a coconut picker! Two years of picking coconuts from the trees!’ His frown becomes a scowl. A dhoni ties up at the quayside and a plump Indian man with an Admiral’s cap and a white short-sleeved shirt jumps out and trots up towards the square. Zaman nudges Miah and they get to their feet, Uddin following them. ‘Sir! Sir!’ calls out Zaman. ‘We are looking for hotel work’. ‘We work very cheaply, sir,’ says Zaman. ‘Work very hard, very cheap.’ He flashes his big white teeth ingratiatingly, stands up as tall as he can, squares his broad chest. The Admiral narrows his eyes and then jerks his head towards the dhoni. Yellow lettering on the dhoni’s navy blue hull reads ‘Heaven Palace Beach Resort Hotel’, although of the three men, only Miah can actually read it. They hasten, before anyone else grabs the opportunity. In the dhoni, the Admiral makes a great show of demanding to see their papers, and then just glances at them. He doesn’t notice that Uddin’s visa is a poor forgery. In return for cleaning the beach and grounds at the hotel, and ‘general duties’, twelve hours a day, they will get a white uniform, a share of a bunkhouse, and two meals a day, plus water and a meagre salary. The rain stops. They sit in the bow of the dhoni as plastic crates of fish and vegetables are loaded on. As the boat leaves Male behind, the floating debris in the deep-water stream becomes less frequent, the sea calms, and they emerge from under a bank of grey cloud to bright sunlight and glittering water. The Heaven Palace Beach Resort Hotel is on its own coral atoll, encircled by white sand. It would take about twenty minutes to walk from the jetty, around the perimeter of the island, and back to the boat. The tourist bungalows and dining facilities are on the outside facing the beach, and the staff quarters, generator, and sewage plant are in the middle, screened off by bushes. The sand is blindingly white and in the middle of the day it burns their bare feet. The paved walkways amongst bungalows, palm trees, and hibiscus bushes, the empty courtyards with fountains, seem eerily silent. It is hard to tell whether anyone is in the bungalows or not. It is all immaculate. Uddin remembers his rubbish strewn town near Rangpur, with rickshaws and buses pushing their way through the noisy crowd, roadside stalls selling pakora, and gangs of children running wild in the streets. There are hardly any children here, and no one sleeps on the pavement. Uddin is amazed that anyone would want to be out in the heat, but the tourists lie on towels on wooden sunbeds, their oiled flesh exposed, drinking alcohol. ‘Don’t look at their bodies,’ Zaman whispers. ‘You may commit a sin’. Uddin averts his eyes. Where he comes from, people know they must be modest and cover certain parts of their bodies. A man should be covered from his waist to below the knee. A woman should show only her face, her hands, and her feet, covering her head in a shawl. It is their faith. ‘Don’t they have any religious belief?’ he asks. ‘They are Christians,’ Zaman says with a shrug. They dump their few belongings in the staff bunkhouse, change in to their uniforms and start work. Uddin catches fragments of conversation that he doesn’t really understand. The tourists, mostly middle aged, seem keen on making an impression, on creating interest by their conversation, their knowledgeability. Some of the women are reading paperback books with mauve covers and pictures of lipsticked women and handbags. Uddin doesn’t like to interrupt, but he is supposed to be clearing up, and the ice cubes have melted in the glasses. ‘Es-scuse me please, sir, madam, you finished drink, sir? Thank you sir. Thank you, madam.’ He places the empty glasses on a tray and carries them to the kitchens. Zaman is swabbing the kitchen floor and Miah is helping to bring in provisions from the dhoni. The Admiral keeps a suspicious eye on them. They are not to idle or pilfer, and at meals, which are leftovers from the hotel buffet, they are not to take more than their fair share of food. He regards Uddin as puny, and he is not sure whether to keep him on. With arms folded, and lips pressed together, the Admiral watches Uddin’s spider-like progress around the beach, as he slowly gathers small pieces of rubbish. Uddin picks his way gingerly among the sunbeds, trying not to look, picking up rubbish, cigarette ends dropped by the tourists, plastic bottles floating in from the sea. He has to be careful not to pick up the coral branches from the sand. The tourists take pieces of the coral away with them. It is not allowed. If it goes on, one day the atolls will disappear beneath the azure sea. Then, one of the tourists is swimming in the sea when she gets into trouble. Uddin can hear her choking on the water. He gives a shout, grabs a lifebelt, and starts to wade out, water coming up the white legs of his uniform. The coral is sharp on his bare feet and he hopes he will not step on a poisonous fish. He feels something swish past his ankles. The water gets deeper, up to his chest. Suddenly the coral drops away and he is lifted to his feet by a gentle movement of the water. He clings on to the lifebelt. Uddin is not a good swimmer, but he kicks himself across to the woman. She is panicking, crying out and spluttering, arms and legs thrashing ineffectually. She is fat and middle aged with red burnt patches on her shoulders, face and breasts. He catches a pungent odour – alcohol – gin? She is at least twice his size. He pushes the lifebelt towards her, averting his face so he doesn’t look. She grabs him and not the lifebelt, dunking him under. He shuts his eyes against the water, hearing bubbles rush past his head as she submerges him, then eventually he bobs up to the surface again. He takes a vital breath, and sees they are only a hundred yards away from the beach. A few tourists are standing up and looking. The lifebelt has floated a few yards away, out of reach. The woman is screaming, gasping erratically. She starts to push him under again. This time he takes a deep breath and grabs the woman by her bikini bottoms, then kicks out as strongly as he can towards the beach. By the time his lungs are ready to burst, she is grazing her hands and knees on the coral in the shallows, retching out water, and starting to laugh raucously as the other tourists flounder into the water to heave her to her feet. Uddin gets his strength back, and drags himself out of the water, blinking saltwater from his eyes and panting in deep harsh breaths. ‘You left the lifebelt in the water,’ says the Admiral, pointing. ‘Go and get it.’ Uddin wades out again wearily and then starts doggy paddling towards the lifebelt. It takes a long time to get it, as it has floated further out into the lagoon. He turns it back towards the beach, kicking gently. From out here he can still hear the woman laughing, and retching. She is sitting back on her sunbed, wiping her drenched blonde hair off her forehead. Her large pink breasts in the little bikini move upwards, as she raises her hands to her hair. He closes his eyes and suddenly remembers the feel of her full hips inside her bikini bottoms. He steers the lifebelt on a diagonal course, away from her and towards the Admiral, who nods grudgingly. Uddin gets himself back to the bunk room, rinses the sand out of his uniform and hangs it on the bushes to dry. That evening, the woman’s husband gives him a big tip. He smiles uneasily as he stammers his thanks. Later, as the tourists party on the floodlit beach, he unrolls the banknotes in the bunkroom. Miah exclaims in awe. ‘A hundred dollars! What are you going to do with that?’he asks. ‘I think, when I get a chance to go to Male again, I’ll give it to the Imam,’ Uddin says. ‘I’m not sure, but I may have committed a sin.’ He blushes deeply. After that, Miah and Zaman are constantly asking him if he has committed any more sins. The Imam at the Islamic Centre in Male is a kindly old man. He listens gravely to Uddin’s tale, and notes his youth and poverty. Uddin sends most of it home, but he keeps a little to buy pakoras for Miah and Zaman before they head back to the dhoni. Thanks Raye, I hope you’re enjoying the Daily Telegraph Creative Writing competition. There are a lot of good stories to read this month. I like your writing style really enjoying this website. “Opinion has a significance proportioned to the sources that sustain it.” by Benjamin Cardozo. Thanks Gladys Deuser, what a great quotation.